I woke up later that morning to find that I was still slowly leaking waters but disappointingly I had not had any contractions. I was due to have a home visit that day from my community midwife who was going to perform a stretch and sweep, so I sent her a text to let her know what was going on. She cancelled my home visit and told me to head to consultant-led unit for a check up. I rang the hospital and spoke to a midwife who told me to come along with my notes, but not to bring my hospital bag as I would be sent home again, as I wasn’t in established labour. We made our way to the hospital at around 10.30. There was a lot of waiting around, but eventually a registrar came to see me accompanied by a student midwife who was holding an industrial sized torch. “Err, please tell me you aren’t planning to shine that thing down there! ?” I said. Unfortunately, the torch was for down there. I had to laugh or I would have cried with embarrassment. The registrar declared that my waters were intact and said to go home. I just knew she was wrong, but who was I to tell a doctor how to do their job. I asked the midwife if she could perform a stretch and sweep before I left, as I was meant to have had one that day anyway. As I dropped my knees, I felt a small gush. “Oh!” said the midwife. “That looks like your waters!” She called the registrar back, along with the student midwife and his industrial sized torch, and everyone agreed that my waters had indeed broken. The midwife performed the stretch and sweep at about midday, then did it again for good measure, noting that I was already 2cm dilated. She left me in the triage cubicle while she went to make arrangements for me to be admitted to the labour ward in the hopes that labour would begin soon, otherwise a c-section was planned for the following morning. My first son’s birth had ended with an emergency c-section, which had involved a J incision. This meant I could not be induced so another c-section was my only alternative. Ian rang my Dad’s partner to let her know that I was being admitted and arranged to meet her back at our house so she could take Little N. He also needed to get my hospital bag, which I hadn’t even finished packing, and some lunch for us as it was now 12.20 and we were all hungry. I suddenly started to feel very anxious and burst into tears. I had never been away from Little N and watching him run out of the cubicle, waving and shouting “bye Mummy!” broke my heart. I could feel the contractions beginning before Ian had even left the hospital, like a small tight squeeze in my belly. But I was sure it was going to be a while before things really got going so I asked him to bring me a book to read and get me some food on his way back. After half an hour things started to feel mildly painful, but I didn’t think much of them so stayed put in my little cubicle, texting some friends. The contractions soon picked up a regular pace and after another hour they were coming every 3 minutes and lasting 50-60 seconds. I began to use breathing techniques that I’d learnt at Daisy Birthing classes to get through them, yet it still didn’t occur to me to tell a midwife what was happening. I was now in established labour but I was more concerned with getting something to eat! I sent a text to Ian at 14.00 to let him know that the contractions were very painful now, but that I still wanted food! As soon as I pressed send on that last message, the contractions became extremely intense. Sitting down was no longer comfortable, so instead I stood up and swayed my hips, focussing on taking deep and centred breaths. It felt like there was a big swirl in my belly and as the contraction built up the swirl got faster and tighter before rippling out all over my body. I closed my eyes and pictured the tide rolling towards a beach. Each contraction was like a wave, building up to a peak and then crashing and fading away. I can do this, I thought. I kept checking my phone for updates from Ian. It was now 14.20 and he still wasn’t back! My Dad’s partner had taken a while to arrive, then he had got stuck in traffic, and when he finally reached the hospital car park it was full! I kept telling myself that I would get through the next contraction and then call the midwife to ask for some pain relief. But as each contraction faded away I would get a new burst of energy and felt that I could cope with one more. So I didn’t call the midwife. I just stayed in my little triage cubicle waiting for Ian. Suddenly, I felt like I couldn’t cope any more. The contractions were so intense that I was throwing myself to the floor with each one. I felt like my legs were being forced apart and as if my pelvis was made of rubber. When the next contraction started to fade I stood up and pressed the button to call the midwife. She came in to find me on the floor again, sweating and moaning. I pushed my phone towards her to show her the contraction times. “I think you need to move to delivery,” she said and went to get my notes. As she came back I could hear Ian coming down the hall, finally at 14.45, over 2 hours since he’d left! “Don’t bother putting your bags down,” the midwife told him. “She’s going to delivery.” We were shown into the delivery suite and told that a midwife would be with us soon. Ian pulled off my trousers, gave me a swig of Coke and went to fetch a midwife. A midwife came in and I told her I need pain relief. She helped me up onto the bed and handed me the gas & air. The next contraction came and I breathed the gas & air like my life depended on it. Whilst it didn’t actually help the pain, it did help me calm down a little. The midwife examined me to see how far I had progressed. To my sheer delight she told me that I was 10cm dilated and encouraged to do as my body feels. All I could feel was an overwhelming urge to bear down so I did. The amazing thing about this part of labour is that it doesn’t hurt, not really. It feels like a lot of effort, as if I was running up the steepest mountain, but it’s not painful and that really surprised me. I kept the gas & air tube in my mouth though, I don’t know why but biting down on it helped. I was on my knees leaning against the back of the bed but the midwife couldn't find a heartbeat, so she asked if I could go onto my back for a while. To my surprise I found this position was really comfortable so I stayed there! The baby’s heartbeat was picked up but was quite low. I hadn’t been monitored while I was in triage so the midwives were a little concerned for his health. I had already pushed for two contractions and he had descended well each time but it was now becoming urgent. The midwife pulled out the biggest pair of scissors I had ever seen and explained that if the baby didn’t come on the next contraction then they would perform an episiotomy to help him out. I begged them not to, but the midwife said that if they didn’t then they would need to get a consultant to come in as the baby was possibly distressed. The midwife had never met me before, she hadn’t even had time to read my notes, but she had already got me sussed: “You don’t want a consultant in here, you don’t want to go to theatre, you can do this, get angry with it Sian, get angry!” As I felt like I couldn’t possibly do it, the midwife knew exactly what words I needed to hear. So on the next contraction, I gave it every ounce of strength I had and pushed. As I felt the contraction starting to fade I quickly took another breath and pushed again. I didn’t want those horrible scissors coming anywhere near me. Suddenly, 3 hours after my first contraction - and after only 50 minutes of "proper" labour - his head was out! Seconds later, his body followed. …Baby J was born on Tuesday 30th September at 15.35 weighing 6lb 14oz. If you missed it last time, you can read Little N’s emergency c-section birth story here. I’d love to read your birth stories! Please share them in the comments below or leave a link, or get in touch if you'd like to feature on Beautiful Births. After reading your first birth story, I'm so pleased for you that you got the birth you wanted and it was nowhere near as traumatic. Congratulations! This has given me a little faith, if you can have a VBAC then perhaps I'll be able to when I have another little one. Well done you! 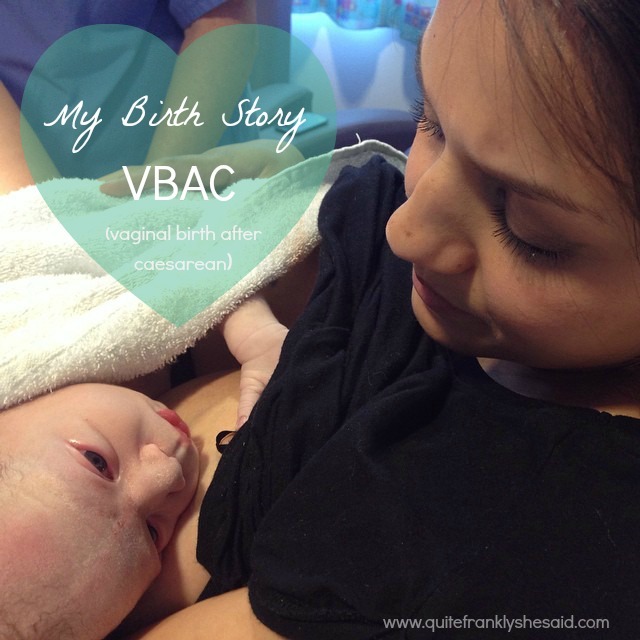 I too had a VBAC with Miss L. I also had an episiotomy and a kiwi ventouse delivery as my midwife knew just how much I did not want another c-section. Thanks for sharing your story. Thank you for sharing, this made me cry with happiness. I practised hypnobirthing with my first baby and had a very calm experience but it ended with a c-section. I'm currently 21 weeks pregnant and I've been told that I should be able to have a natural birth this time. Reading your experience is making me feel positive that this is achievable. I love how you described your birth story. You did amazing. You made it sound not as bad as what I had in mind.